Given that the office spaces from the heartbeat of your business operation, ensuring that the interior design choices encourage maximum productivity is essential. The furnishings and furniture choices should sit top of every entrepreneur’s agenda, and 3 person workstations are the ideal solution. When you find the right option from our extensive range, it provides your entire venture with a platform to thrive. Whether you run a team of 30 or 300, utilising the office space in the most efficient manner should be a priority at all times. After embracing cloud computing and other modern technologies in order to save time, space, and money, it’s imperative that the furnishings support your quest for the perfect working environment. With a desk for 3 people, there are many different options at your disposal. Whether it’s straight ‘side by side’ design or a ‘120 degree cluster cutter’ doesn’t matter. Finding solutions to maximise the use of space while maintaining the aesthetic beauty becomes a very easy task. The option to have screens, or choose between straight legs and loop legs, makes it possible to merge open plan with a more private workspace too. Whatever your needs might be, a 3 person desk is up to the task. Every member of your team has a huge role to play in the future of your business, but they each have individual preferences and personal assignments to complete. Knowing that their office workstations can cater to those needs is essential. With a 3 person desk, the opportunities to tailor each section accordingly are simply incredible. Under desk storage can be added to create multiple different layouts. In turn, this added comfort and sense of personalisation ensure that a 3 person desk will keep the whole team happy. Furthermore, if staff members move to new departments, they can easily take those accessories to the new location. With mobile pedestals and caddies at your disposal too, all staff members can reap those rewards. Whether it’s building the perfect workspace for today or thinking about the evolving needs as your business grows, 3 person office workstations are an ideal solution. An aesthetically pleasing workspace counts for very little if employees are unable to unlock their true capabilities. Aside from the healthy surface areas, 3 person workstations are designed to work in conjunction with the best office seating facilities. This in itself can be highly influential. The use of task chairs and executive chairs will inevitably bring comfort and function to another level. When the office desks and chairs are in good health while being supported with the right work facilities, there’s no limit to what your employees can achieve. 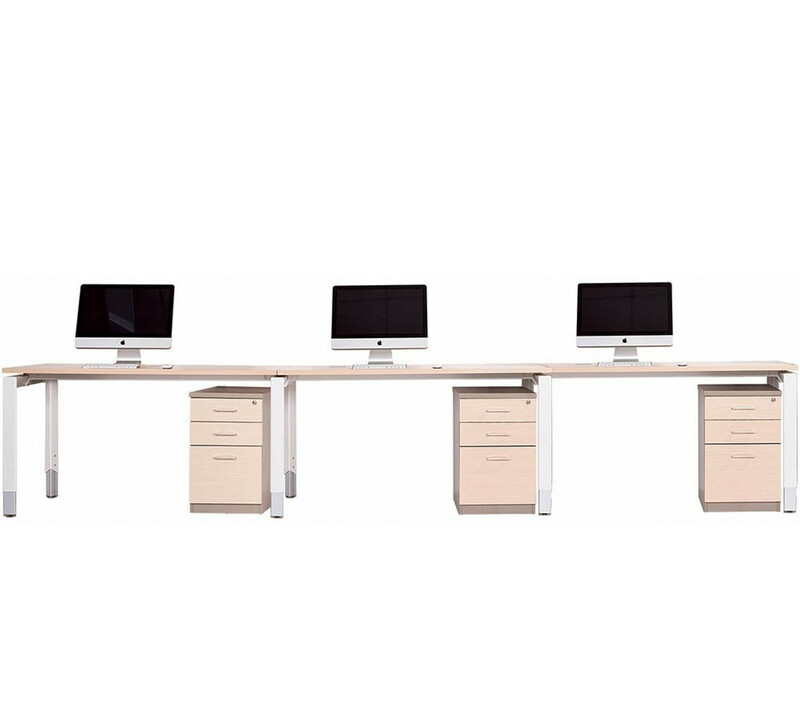 The fact that 3 person workstations are also an affordable, durable solution is simply a bonus. Whether kitting out the working environment for one division or the entire workforce, our range of 3 person workstations tick all the boxes in emphatic style. A better workspace and more efficient workforce await.